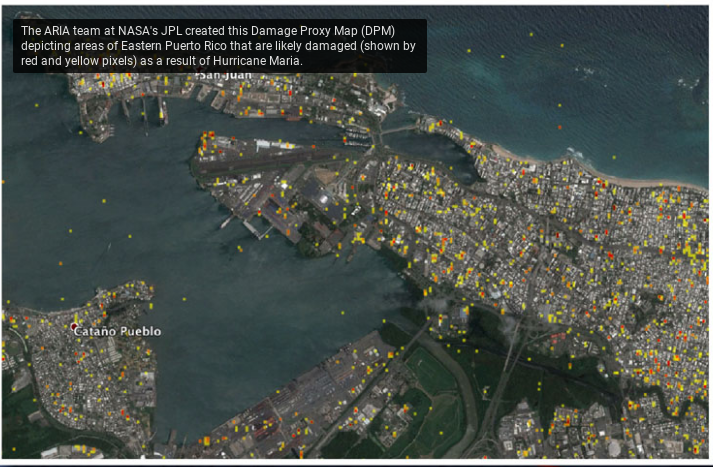  Public Lab: Can NASA VIIRS data used for disaster maps? Question: Can NASA VIIRS data used for disaster maps? Looking at maps from the Suomi satellite of fires in the Western US, destruction of Rohingya villages- I wondered, how can this data be used after disasters like Harvey, Irma, Maria, Mexican earthquakes to help document damage and help communities recover? For example, the burning organic peroxides of Arkema should show up well, and help the neighborhood document what really happened. A chronology showing how & where temperatures changed could be helpful. Fire temperatures may help narrow down which toxins were released. Also, IR data can map damage to plants from flooding, wind, or pollution, and help track recovery progress-or lack. How do you look for oil sheen if the water's already receded? Wow, this sounds promising. Can you upload a screenshot of what that kind of map data looks like? The following articles may be useful in deploying VIIRS data for disaster damage impact: Chris Justice (NASA Goddard) et al. link to the full article http://onlinelibrary.wiley.com/doi/10.1002/jgrd.50771/full which appeared in the Journal of Atmospheric Research. Purdue's MultiSpec freeware could potentially be utilized to analyze the data. Contact Larry Biehl https://engineering.purdue.edu . Visible Infrared Imaging Radiometer Suite is accessible through https://earthdata.nasa.gov . NASA's disasters program has conveyed to the Federal Emergency Management Agency (FEMA) a guide of areas in eastern Puerto Rico that Do my Assignment have likely been harmed as the result of the landfall of Hurricane Maria on Sept. 20. The Advanced Rapid Imaging and Analysis (ARIA) team at NASA's Jet Propulsion Laboratory in Pasadena, California, and Caltech, also in Pasadena, created this Damage Proxy Map (DPM) depicting areas of Eastern Puerto Rico that are likely damaged (shown by red and yellow pixels) as a result of Hurricane Maria (Category 4 at landfall in Puerto Rico on Sept. 20, 2017). The map is derived from synthetic aperture radar (SAR) images from the Copernicus Sentinel-1A and Sentinel-1B satellites, operated by the European Space Agency (ESA). The images were taken before (Mar. 25, 2017) and after (Sept. 21, 2017) the landfall of the storm. The map covers an area of 169 by 96 kilometers. Each pixel measures about 30 meters across. The color variation from yellow to red indicates increasingly more significant ground surface change. Preliminary validation was done by comparing the anecdotal reports of damage. This damage proxy map should be used as guidance to identify damaged areas, and may be less reliable over vegetated areas and flooded areas. Sentinel-1 data were accessed through the Copernicus Open Access Hub. The image contains modified Copernicus Sentinel data (2017), processed by ESA and analyzed by the NASA-JPL/Caltech ARIA team. This research was carried out at JPL under a contract with NASA. Copyright contains modified Copernicus Sentinel data (2017), processed by ESA and analyzed by NASA-JPL/S.Yun (Project PI under NASA Disasters Program). InSAR data processing: NASA-JPL/Caltech ARIA team. For more information about ARIA, visit: http://aria.jpl.nasa.gov "